I wrote this piece with some thoughts about changing active transportation and street life in downtown St. Catharines, Canada. Fifty years ago, we began to learn about city planning and living in a different way. The publication in 1961 of “Death and Life of Great American Cities” by Jane Jacobs turned a corner in the way we think about cities. The book still resonates with those who think and plan about the future directions of cities. I first read the book, with wonder, about 1963. I began to imagine a different future for cities. Since that time, I have measured many of the city sights I see against the potentials that were held in Jane Jacob’s book and in her later publications about the economies of cities and regions. 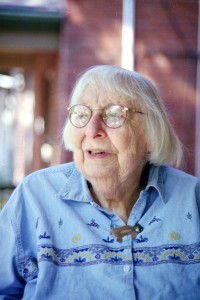 In the mid-1990s Jane Jacobs and I became friends and our friendship continued until her death in 2006. I came to appreciate the way she thought about things. Her writing 50 years ago helped turn aside the linear way of thinking about traffic growth and subdivision sprawl. As time went on she described her ideas and writing as being interlaced like a spider’s web, “a web way of thinking”. I produced an educational TV program about her entire work and the evolution of her ideas (Jane Jacobs: Urban Wisdom, 45 minutes, 2002). In a series of video interviews over the years, Jane reflected on her writing and her ideas. She called herself a non-fiction writer and resisted the “urban-guru” nomenclature. In The Death and Life of Great American Cities, she felt the way streets worked was the key to understanding the potential of cities, “people weren’t just walking around or riding around with nothing on their minds but where they were doing all kinds of other things, by the way…the more you watched the more interesting and amazing connections you saw. In the City of St. Catharines, for example, I have seen how a return to two-way traffic has again given pedestrians rights that had been lost to one-way traffic that was concentrating in getting through the area. It is interesting to watch cars now defer to pedestrians at crossings. A politeness has been achieved (mostly). Living here in the Niagara region I think about those talks with Jane and what I am observing. I look for active street life. I notice vacant sidewalks. Yes, I see the dominance of the automobile but I see instances of people reclaiming streets and parkettes. I have hopes that the new performing arts centre slated for completion in 2015 in St. Catharines will allow for wide walkways and places to interact. How people get from the marketplace, city square and library to the arts place is of concern, not just the buildings themselves. How would Jane Jacobs observe our current concerns about “intensification” within our urban limits? She once said “do not be afraid of density” and went on to talk about how density of people and their activities was the very breath of a lively and livable community. Looking back on the fifty year history of this important “non-fiction writer,” I think most about how Jane thought about things and the interconnections she observed. – She corrected an interviewer from New York City every time he referred to this or that “issue”. She said it was not an issue, it was a “problem”. For me it was a good way of getting to the subject at hand instead of couching it in elliptical terms of being a debatable issue. Don Alexander lives in St. Catharines. He was an elected member of Niagara Regional Council and its Planning Committee for two terms in the 1970s. He is now a Commissioner on the Niagara Escarpment Commission. In the 1960’s he was part of a team that used alternative methods—like the web way of thinking– to eliminate ship delays and congestion in the Welland Canal. This entry was posted in Transportation and tagged Active Transportation, Jane Jacobs by donalexander. Bookmark the permalink.